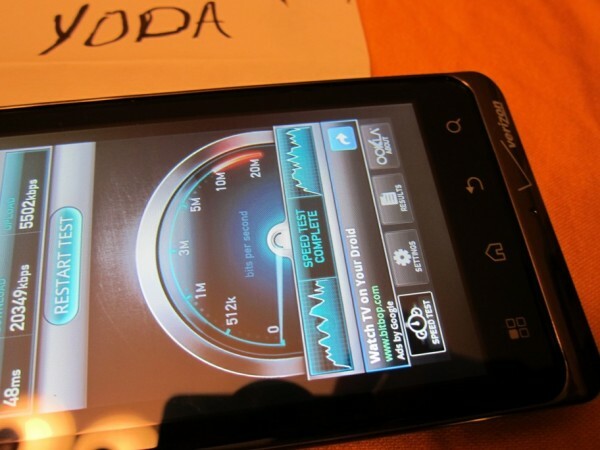 We knew that the DROID Bionic would be the world’s first dual-core 4G LTE device, but we had yet to really see it show off the download speeds that it was capable of. Thanks to another tester in the wild, we get just that today. And this is exactly why this phone has been talked about for 8 months now – because it’ll have power, style, and run on Big Red’s shiny new network. The leaker (Yoda) has also mentioned that he is seeing 15 hours of battery life with moderate usage, something that no other LTE device can really say at this time. We had been hearing from our sources that Moto reps couldn’t stop raving about the massive battery and how long it lasts, so to get confirmation from a tester is a nice add-on. And is it just me, or have the pics from the last two days that we’ve seen with the screen on, look much less PenTile-y than the DROIDX2 and DROID3? I know, I know, it’s almost impossible to tell from these quick ninja-shots, but they definitely aren’t looking awful. With the LTE Galaxy S II news from this morning followed by these Bionic speed tests, it’s probably safe to say that DL readers are officially torn between the two. We 100% know that the Bionic is coming in September – the SGS2, is still a mystery.